And Kirk came around a screen and went to the rim with no real plan, where he was bailed out by a questionable foul call. He then had two free throws to tie the game and missed the first, putting a nail in the coffin. The only thing I could think at the time (you know, aside from “what did I do in a former life to deserve watching a Bulls team that is forced to give the ball to Kirk Hinrich in crunch time?”) was that at least Hinrich’s time in Chicago should be coming to an end soon. I know that at times during his two stints in Chicago, I’ve been a bit harder on Kirk than I really needed to be. Honestly, it started with the night he was drafted. With the Bulls holding the seventh pick of the 2003 draft, I really wanted them to take a player I had fallen in love with during the NCAA Tournament a few months before, a kid from Chicago that led his Marquette team to the Final Four. …made it a lot easier not to like him. What the hell was this goofy looking white guy going to do for the Bulls? 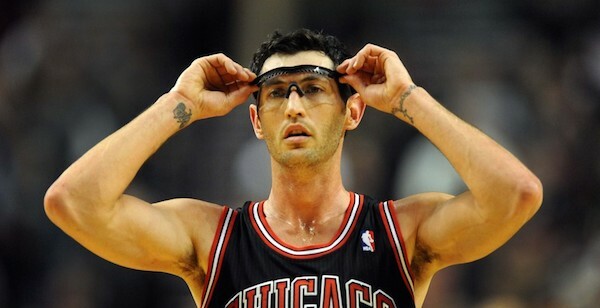 In truth, Hinrich wasn’t bad for the Bulls. In fact, during his first four or five seasons he was pretty good. He had a PER of 14.9 in that span, and during the 2006-07 season when the Bulls nearly won 50 games and swept Miami in the first round of the playoffs before falling to Detroit, Kirk was fantastic. It was far and away his best season with the Bulls. Things would go downhill from there, though, and the closer he got to 30, the readier I was to part ways. That day finally happened in June 2010 when he was traded to Washington (part of the CLEAR CAP SPACE FOR LEBRON, BOSH AND WADE summer that worked out so well). I respected what he’d done as a Bull, but I was just ready to move on. Then he came back. He still had a house in the area, after all, so it made sense for the Bulls. Once again I found myself mad at Kirk for things that he couldn’t really control. When you’re a 31-year old guard coming off two mediocre-to-bad seasons with Washington and Atlanta, and the Bulls, the organization with which you began your career, are offering you $8 million over two years, it’s hard to say no. The fact is, if there is anybody I should have been upset with, it should have been Gar Forman and John Paxson. The Bulls drafted Hinrich nearly a decade earlier because the better option was gone. This time they actively went after him. But I blamed Hinrich. He didn’t help matters, either, as these last two seasons he’s played exactly like a Kirk Hinrich in his 30s is supposed to play. Sure, he was supposed to be in a position this year as a backup and mentor to Derrick Rose but was thrust into the starting lineup through circumstances out of his control, but you know what? Whether his fault or not, watching Kirk Hinrich play 30 minutes a night when the plan was to watch Derrick Rose playing about 35 to 40 doesn’t exactly make watching Hinrich a joy to watch as a Bulls fan. Anyway, as you can see, I don’t know how rational my dislike of Kirk Hinrich is. I just know that he’s never really had a chance with me since he came to Chicago, and whether that’s fair or not, I don’t care. This is sports, and I’m a fan. I don’t have to be fair if I don’t want to be. So when this Bulls season ends in the next week or so, while others will be upset, I’ll be happy to know that Kirk Hinrich’s time in Chicago is done. His contract will be up and the Bulls will be moving on! Or at least, they’ll be trying to be. Like last time, the Bulls will say goodbye to Kirk in an effort to clear the necessary cap space for Carmelo Anthony. Then Carmelo Anthony will decide to stay in New York, or go to Houston or anywhere aside from Chicago. At that point John Paxson will say to Gar Forman that “you know, Kirk does still have a home in the area” and he’ll re-sign with the Bulls. 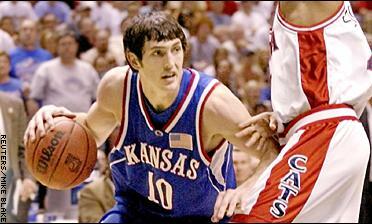 And I’ll blame Hinrich for that too. This entry was posted in Chicago Bulls and tagged Bill Self, Derrick Rose, Dwyane Wade, Gar Forman, John Paxson, Kirk Hinrich by Tom Fornelli. Bookmark the permalink.